Are you very sure that the person on the other side of the internet world is your friend in the contact list? No, we just see the profile pic or sometimes we chat through text messages. The identity of the person is not scanned everywhere or every time when the person login to any application or any chat window or while doing any transaction. The security concerns come into the picture for such identity issues. Developers invested their efforts to develop the safe and secured Blockchain technology, especially for the safe and secure digital transaction. The features of Blockchain technology is extended to filter out all the security concerns. Digital identity management was one of the major security concerns in this digital world. Every second when you go online in your system, the system is vulnerable to any hacker. Your personal data or credentials are stored in some important database of the application. The hackers may know to hack the system. So it always advisable to have software to identify your face or fingerprint or store your personal identity so that it is not easily accessed by any third party. As I already discussed the chances of getting hacked is more when you are doing something online. Especially if you use any website or any important application frequently, each time you access to the particular database to retrieve any important data or it stores your credentials to that particular database. In many payment gateways like Amazon Pay, Google Pay, it requests you to enter the login details or sign up before processing the fee details. It clearly shows that your personal data is stored in their database. It is more vulnerable to any attack from outside. Sometimes as per the consent provided to you, only the owner of the database will have access to the database so you will not be knowing whether it is not really shared with the third party or not. There are chances for those data to be shared with any third party and hacking. Here all the information related to the user may be stored in a single place, it means it may follow traditional centralized database storage. When hackers try to do any fraudulent activities, it becomes more easy for them to collect each and every information from a single centralized database. These disadvantages or limitations intended to develop Blockchain technology where it follows the decentralized network and the important credentials are not saved in one place. Now the system is not more vulnerable to any third party or theft. Why Blockchain technology is preferred? Blockchain technology means the data is stored in connected blocks which are not managed by any centralized database or any main administrator. So an individual can store his personal data in different blocks which cannot be accessed by any third party since there is no centralized administrator to keep a record all the data in a single place. Modifying the data in the block is really difficult as it is connected with another block through some hash algorithm. It is not easy for the hackers to get complete details about any individual. As it is an encrypted text and needs a private key to decrypt the text. So the text will not be in a readable form for any hacker. 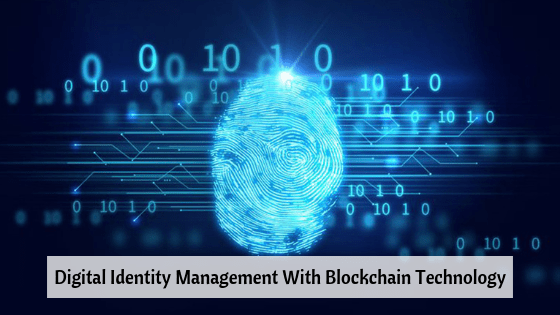 In this way, Blockchain is preferred to maintain the data for identity management. It protects the data being theft by the hackers and it deals strongly with the authentication and it is the strong base to handle any security concern. The Future of Blockchain Technology is bright and secure. Node basically refers to a computer which is connected as a system in the network of a blockchain. The communication of sending and receiving data is enabled through this node. A full node is a client that is connected in the network to maintain the complete backup of the blockchain. It updates the block with the confirmations and entries from miners or hackers. It never relies on the connected nodes. It checks the data received from each and every node independently. Finally, In this article, we have seen the advantages of using the decentralized network for storing the user identity and how Blockchain for Digital Identity, functions to manage the user. Blockchain technology is a way forward to research and enhance the security features in the blockchain so that the users gain full control over their identity management and the system is strongly protected by authentication with cryptography techniques. Hence, the Role of Blockchain in Cyber Security is important. This makes more convenient to use the technology for digital identity management.